Deutsche Bank dominates the headlines today (see here, here, and here). 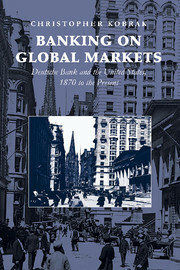 For anyone seeking an understanding of the long-term roots of the problems now confronting Deutsche Bank, Christopher Kobrak‘s Banking on Global Markets: Deutsche Bank and the United States, 1870 to the Present (New York: Cambridge University Press, 2007) is truly essential reading. Deutsche Bank’s current woes stem, in large part, from its US operations and, one can argue, from the bank’s expansion in in recent decades, a process associated with its acquisition of Morgan Grenfell in 1989 and then the Bankers Trust in 1997. In this essentially unrelated video, Prof. Kobrak discusses the history of financial crises. It seems like a good time to share it, nothwithstanding the Wall Street Journal‘s confident declaration that Deutsche Bank will escape the fate of Lehman Brothers.